There is currently just the 1 ferry route running between Cyprus and Turkey operated by 1 ferry company – Akgunler Denizcilik. The Kyrenia to Tasucu ferry crossing operates weekly with a scheduled sailing duration from about 6 hours. 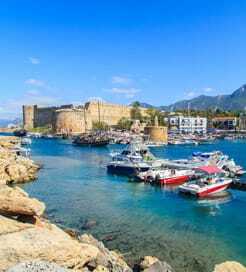 Whilst we’ve taken great care to ensure the information on this page is correct, as the frequency and duration of crossings on all routes can vary from time to time we’d advise that you get a live quote for current availability on this Cyprus Turkey crossing between Kyrenia and Tasucu. Turkey is on the Mediterranean in Western Asia, with a small section in Southeastern Europe, with the Mediterranean Sea on the Southwest, the Aegean Sea on the West and the Black Sea on the North. As the cradle of cultures and civilisations connecting Europe and Asia, Turkey is well known to have accumulated a large cultural heritage of historic sites and archaeological wonders. However, apart from the historical relics, there’s much more to be admired, from its soaring mountains and fertile valleys, to its sleepy villages and white sand beaches, all as part of the Turkish legacy.